Daniel Garber (1880–1958) remained connected to the Philadelphia art scene throughout his career. After his artistic training at the Pennsylvania Academy of the Fine Arts (1899–1905), Garber taught at the Academy for over forty years. Through his association with the Pennsylvania Impressionism movement, he trained several budding artists in the new style, including Philadelphia-born Mildred Miller (1892–1964). Throughout his career, Garber became nationally acclaimed, winning the Cresson Scholarship from PAFA in 1905, the Hallgarten Prize from the National Academy of Design in 1909, and the Temple Gold Medal from PAFA in 1919. His works are displayed nationwide by institutions such as the Smithsonian American Art Museum, the Art Institute of Chicago, the Philadelphia Museum of Art, and the Pennsylvania Academy of Fine Arts. 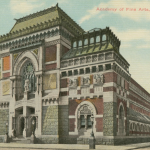 Established in 1805 by Charles Willson Peale (1741–1827) and other artists and businessmen, the Pennsylvania Academy of the Fine Arts (PAFA), pictured in this early twentieth-century postcard, was the first art museum and school in the nation. At the Academy from 1899 to 1905, Daniel Garber (1880–1958) was educated in impressionism, the main style in which he painted throughout his career. Garber won the Cresson Scholarship in 1905 to train in Europe; there, he studied French impression, a style evident in The Orchard Window (1918). PAFA has continued to train artists into the twenty-first century. Its galleries combine contemporary and historical works, including local and regional artists among works by some of the nation’s most significant nineteenth and twentieth century artists. In the early twentieth century, painters gathered to establish an art colony in New Hope, Pennsylvania, where they could exchange ideas and techniques. The artistic movement that took place within this colony became known as Pennsylvania Impressionism or the New Hope School, and were characterized by broad brushstrokes and focus on landscape settings. Daniel Garber was an ardent member of the movement; however, his work is marked by the use of precise and delicate brushstrokes, which were characteristic of his training at the Pennsylvania Academy of Fine Arts. 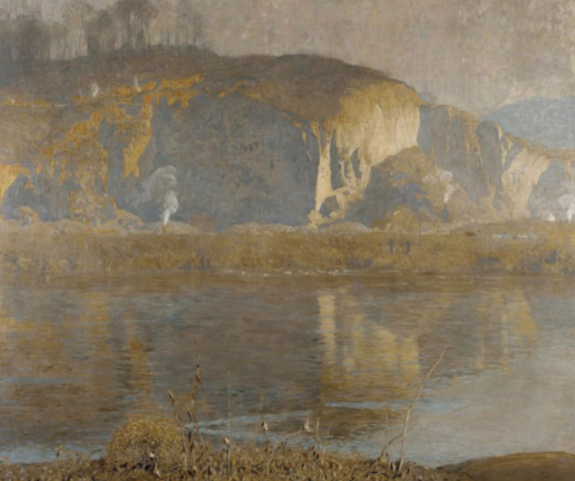 Pennsylvania Impressionism was considered more American than other styles due to its intense focus on the American landscape, as exemplified by Quarry (1917), which depicts a scene on the Delaware River across from Limeport, Pennsylvania. This American style of painting greatly influenced Philadelphia painters and was celebrated nationwide until attention shifted to the rising abstract art movement during the second half of the twentieth century. With its bright colors and precise brushstrokes, The Orchard Window (1918) is distinctive of Daniel Garber’s (1880–1958) artistic style. 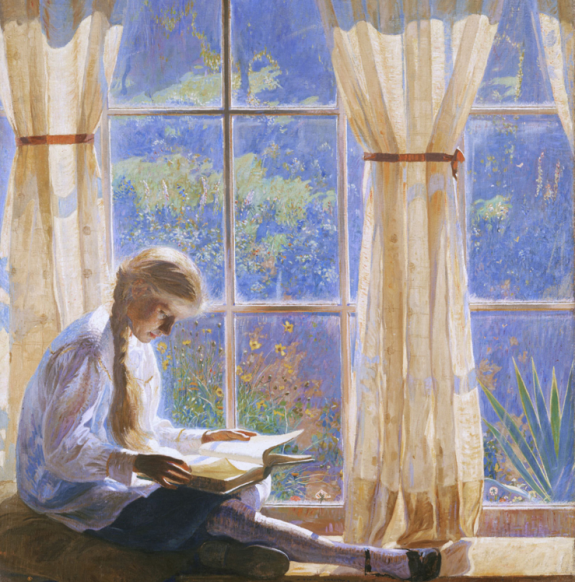 Much of Garber’s work focused on his family life; in the painting his daughter Tanis (1906–90) reads in front of a window overlooking an orchard. The sunlight coming through the window reflects the influence of Garber’s time studying impressionism in France. During the year of the painting’s creation, the nation faced its second year of involvement in World War I and a flu pandemic that would claim the lives of 675,000 people. The artwork provided an escape into the Garber’s idyllic home life. 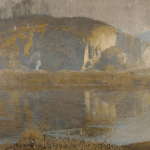 Although the painting won the Temple Gold Medal in 1919, it fell into obscurity until its exhibition in the Philadelphia Museum of Art’s Bicentennial exhibition in 1976. It has since become a pop culture icon and continues to project a sense of peace. Popular attention was waning in Daniel Garber’s (1880–1958) paintings during the second half of the twentieth century. During the artist’s lifetime, his works were seen as embodying a truly “American style” of art. With the rise of abstract art, critics began to question whether a country could have its own representational style, leading to decreased interest in Garber’s works. It was not until the Philadelphia Museum of Art displayed The Orchard Window in the 1976 Bicentennial exhibition, Philadelphia: Three Centuries of American Art, that interest was once again sparked in Garber’s work, and the painting was heralded as a historically important piece of Philadelphia artistry. 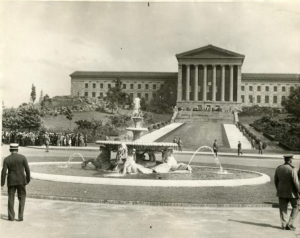 This photograph depicts the Art Museum in 1928. Painted in 1918 by Philadelphia artist Daniel Garber (1880-1958), The Orchard Window depicts the interior of Garber’s studio in Bucks County, Pennsylvania, and features his 12-year-old daughter Tanis sitting in a sun-dappled window seat, reading a book. This large oil painting on canvas has been highly regarded as a prime example of Pennsylvania Impressionism, a variation on the French Impressionism of Claude Monet (1840-1926) and Camille Pissarro (1830-1903). The Orchard Window is one of Garber’s masterpieces, dating from a period when the artist reached the height of his popularity. In this painting, Garber combined the atmospheric concerns of impressionism with the sharp, careful drawing typical of all graduates of the Pennsylvania Academy of the Fine Arts. By flattening out the picture plane in the background (in other words, by making the view out the window almost two-dimensional), he also added a decorative quality that was new to his work at the time. Born and raised in Indiana, after a brief period of study at the Art Academy of Cincinnati Garber moved to Philadelphia and enrolled at the Pennsylvania Academy of the Fine Arts. There, and at the Darby School of Art, a summer school in nearby Darby and Fort Washington, Pennsylvania, he received training from artists such as Thomas Anshutz (1851-1912) and Hugh Breckenridge (1870-1937). 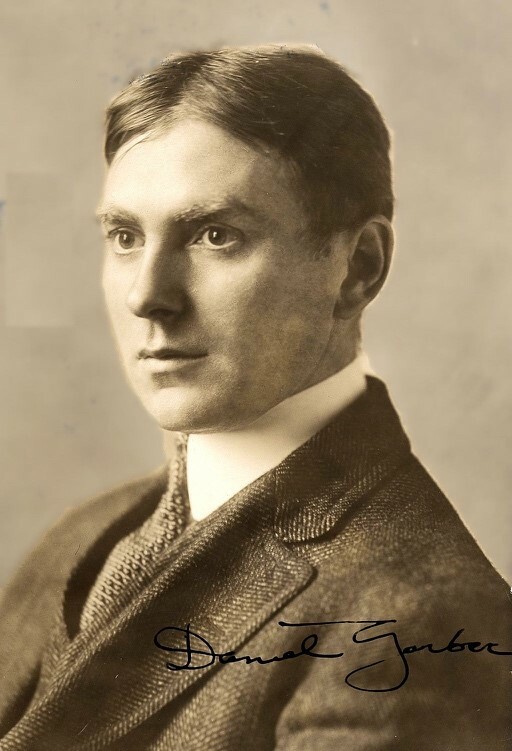 In 1905, he won the academy’s coveted Cresson Scholarship, which enabled him to travel and study in Europe for two years. In Europe, he encountered French Impressionism, which inspired him to become one of America’s leading artists working in the impressionist mode. Garber returned to the United States in 1907 and settled with his wife, Mary, in Lumberville, a village just north of New Hope, Pennsylvania. 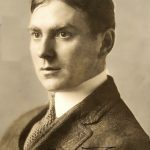 He became a longtime leader, along with Edward Redfield (1869-1965), of the artist colony that sprang up in the New Hope area in the first quarter of the twentieth century. Garber’s studio at Cuttalossa Farm served as the setting for many paintings of his daughter Tanis, with whom he was very close. He loved the sunlight that came in through his studio window and the flower garden that stood just behind his studio. He took a great deal of pride in, and solace from, his home in the country, as can be seen vividly in The Orchard Window. Garber for many years also had a home on Green Street in Philadelphia, where he lived during the academic year until about 1926. He began a long and successful career as a teacher, first at the Philadelphia School of Design for Women (later Moore College of Art and Design), and then at the Pennsylvania Academy. The critical and public responses to The Orchard Window illustrate the changing tides of Garber’s critical fortunes over the next century. The oil won the Temple Gold Medal for best painting at the 1919 annual exhibition of the Pennsylvania Academy, and magazine and newspaper reviewers immediately touted the work as very “American.” According to Gardner Teall (1876-1956), writing in 1921, “it reveals the spirit of American art, a thing one sees and feels, but which perhaps, is not so easy to define.” By 1930, however, critics were questioning whether it was possible to speak of any country as having a unique, instantly identifiable style of oil painting. Garber’s representational art gradually fell out of favor during the second and third quarters of the century, with the rise of abstract art. Garber’s work had almost been forgotten by 1976, when the Philadelphia Museum of Art included The Orchard Window in its Bicentennial exhibition of American art. The public, however, responded very enthusiastically to The Orchard Window at that exhibition, which in part motivated a 1980 Garber retrospective at the Pennsylvania Academy. This exhibition marked the centennial of the artist’s birth (as well as the 175th anniversary of the founding of the academy). More exhibitions of Garber’s works followed, several books and catalogues appeared, and his works earned higher and higher prices at auction. The reestablishment of his reputation, and that of his fellow New Hope School painters Edward Redfield (1869-1965) and Walter Schofield (1867-1944), drew in part from the nationalism surrounding the Bicentennial as well as from the realization, in many circles, that representational art was just as valid and important as nonrepresentational art. The work of Andrew Wyeth (1917-2009), for instance, and that of his fellow Brandywine School artists, became perceived as serious creative art by critics who had once panned it as “mere” illustration. By the early twenty-first century, art historians regarded Garber as one of the Philadelphia area’s most important contributors to the history of American art. The Orchard Window became so popular that it appeared on jigsaw puzzles, coffee cups, placemats, and even advertisements for the Philadelphia Museum of Art. In 1918, The Orchard Window represented a moment of calm to viewers who were wrestling with World War I and many other serious issues, among them racial tension and the beginnings of a flu pandemic that would kill at least 675,000 Americans. The painting continued to function in that manner in later years, bringing respite to viewers feeling unsettled by the pace of twentieth- and twentieth-first century life. Alterman, James M. New Hope for American Art. Lambertville, N.J.: Jim’s of Lambertville, 2005. Folk, Thomas C. The Pennsylvania Impressionists. Madison, N.J.: Fairleigh Dickinson University Press, 1997. Foster, Kathleen. Daniel Garber, 1880-1958. 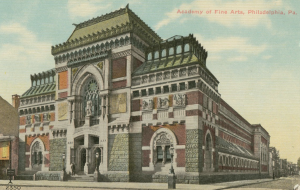 Philadelphia: Pennsylvania Academy of the Fine Arts, 1980. Gerdts, William H. American Impressionism. Second ed., New York: Abbeville Press, 2001. Humphries, Lance. Daniel Garber: His Life and Work. New York: Hollis Taggart Galleries, 2006. Daniel Garber: Romantic Realist. Philadelphia: Pennsylvania Academy of the Fine Arts, and Doylestown, Pa.: James A. Michener Art Museum, 2007. Peterson, Brian H, and William H. Gerdts, Pennsylvania Impressionism. Doylestown, Pa.: James A. Michener Art Museum, and Philadelphia: University of Pennsylvania Press, 2002. Sewell, Darrel, et al. 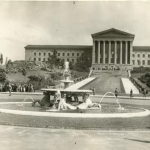 Philadelphia: Three Centuries of American Art. 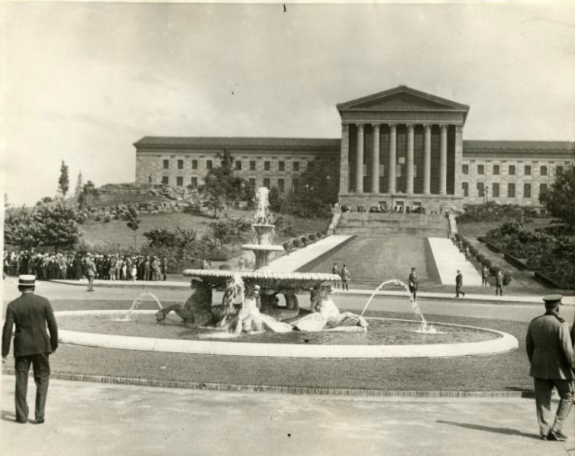 Philadelphia: Philadelphia Museum of Art, 1976 (reprinted 1990). Teall, Gardner. “In True American Spirit: The Art of Daniel Garber,” Hearst’s International 39, No. 6 (June 1921): 28, 77. Daniel Garber Papers, Dorothy and Kenneth Woodcock Archives, Pennsylvania Academy of the Fine Arts, 118 N. Broad St., Philadelphia. Daniel Garber’s home and studio, 6685 Cuttalossa Road, New Hope (Solebury Township), Pa.
Philadelphia Museum of Art, Twenty-Sixth Street and Benjamin Franklin Parkway, Philadelphia. Pennsylvania Academy of the Fine Arts, 118 N. Broad Street, Philadelphia.